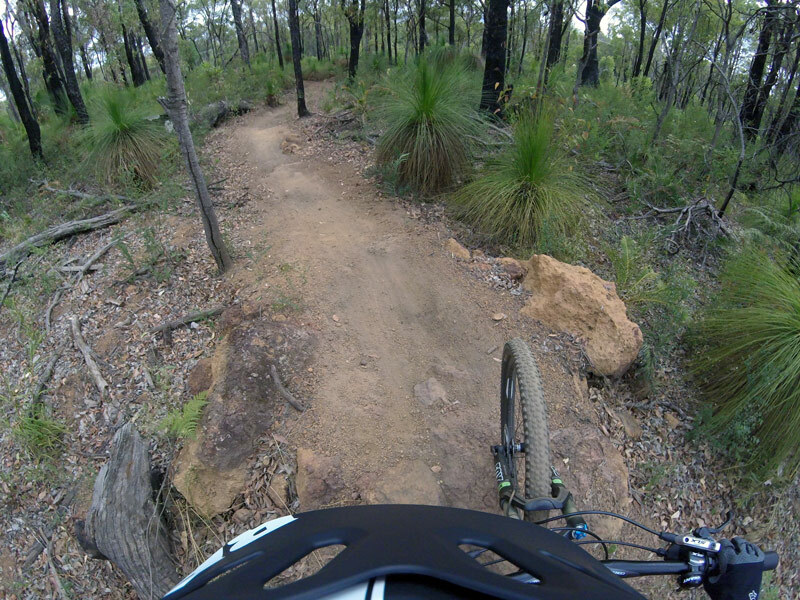 There is loads of quality riding options along the Kalamunda Mountain bike trails and having cycled the green trails, the next stage of progression is the blue graded ones. This also means access to a larger number of trails in the area and an opportunity to ride deeper in the forest as well as a few runs down the reasonably steep Mt Gunjin. 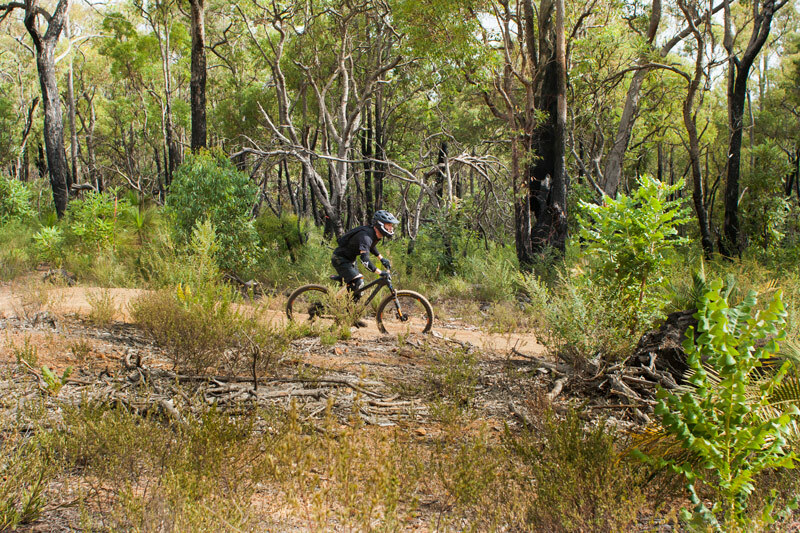 Set in regrowth forest the mountain bike trails meander through some scenic landscape. Spring has arrived in Western Australia and with that the wildflowers add colour to the area. The photos in this post are a collection taken over the past year. The area not only looks different from one season to the next, it also offers changing riding conditions from wet puddles to the famous dry pea gravel. One year on and I’ve added a few of the blue trails to my mountain biking repertoire. Route: Camel Farm link to Mundaring Weir Road/ Black Stump Carpark, Tangaroo Kick, Lost and Found, Rocky Balboa, Mother in Law. Reach Mt Gunjin. Judderbars. Brand New Second Hand. Drago. Reach Mt Gunjin. Three Bears. Muffin tops. Horny Devil. We park at the Camel Farm, leaving money in the box provided. For those unaware the camel farm is an independently run tourist attraction business and thanks to the owners over the years visitors have had a safe spot to park. Be sure to bring some cash along with you. There is a small café open opposite the car park. Setting out we travel along the camel train trail to black stump car park following a careful cross of Mundaring Weir Road. This car road heading left leads to Mundaring Weir pub and it’s a popular pass through for road cyclists. 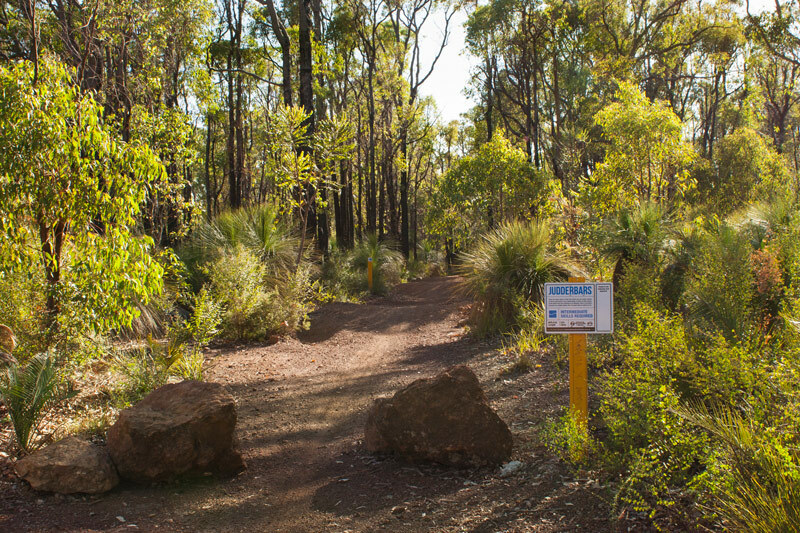 The Munda Biddi trail in a north direction passes the pub as well as the Kalamunda trails, a good option for a drink and pizza afterwards and to extend the ride into a cross country one. There is a large map sign near the pump track and another one at the bottom of the Alchemy trail. Kalamunda Collective also have a copy on their website here. We pedal the short Tangaroo Kick trail ending up at a junction where we can ride Flaccid Ashback or turn right and head down a firebreak road which is best described as straight and bumpy. We go for the firebreak route as we want to take the most direct path this time and conserve a little energy for the later runs. We are travelling downhill and aside from the bumps the ride is fairly easy with minimal pedalling. We ride side by side in this section. The trail crosses another firebreak road and passes the exits of two downhill trails, Luvin Shovels and Mercury Street. Leaving the firebreak road we roll onto a single track trail Lost and Found and it’s a steady ease into the climb starting at 266 metres. 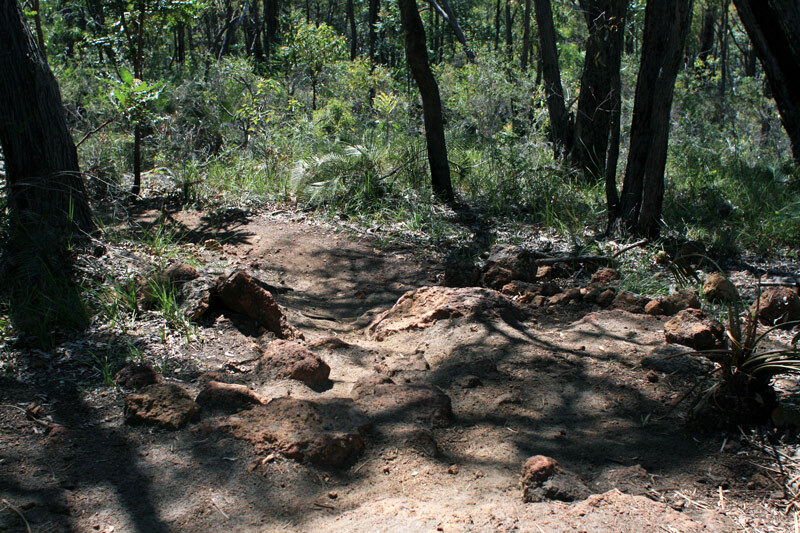 Aside from the Munda Biddi and firebreak tracks in the area, the sign posted trails are single track. If we’re looking for a positive thought about a hill climb it’s the opportunity to appreciate the surroundings and with the appearance of wildflowers either side of the trail, the scene certainly makes the ride even more enjoyable. 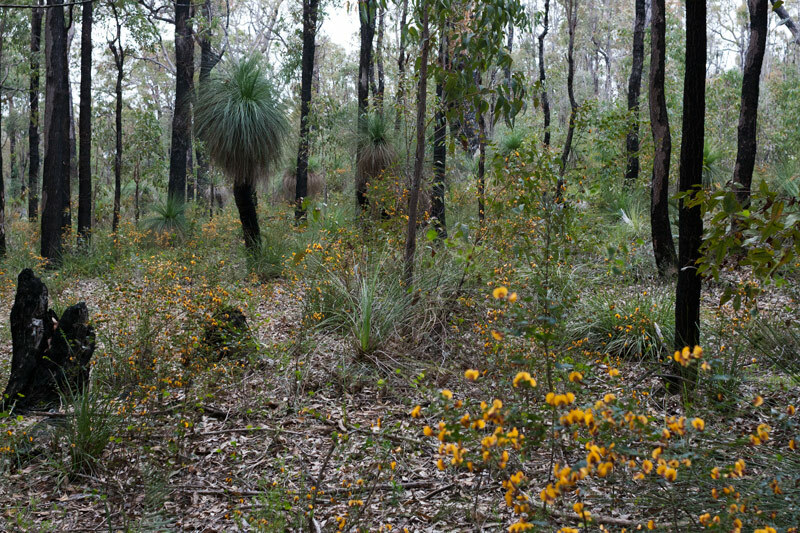 There are signs of a previous fire in the area from the charcoal tree trunks, however against the green regrowth the scene does look beautiful. There are a couple of very old surviving trees in this section. 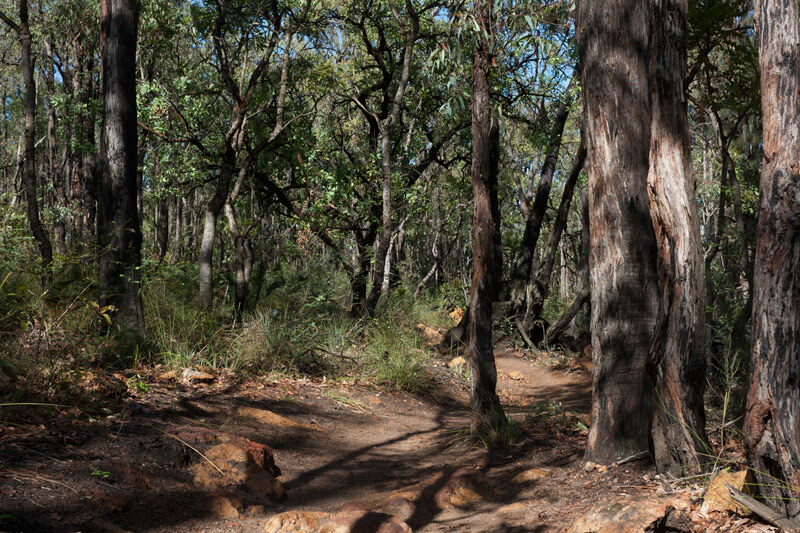 The last time I was on this trail in the early morning hours I was lucky enough to encounter a Kangaroo, only by chance when I heard a rustle and turned around. 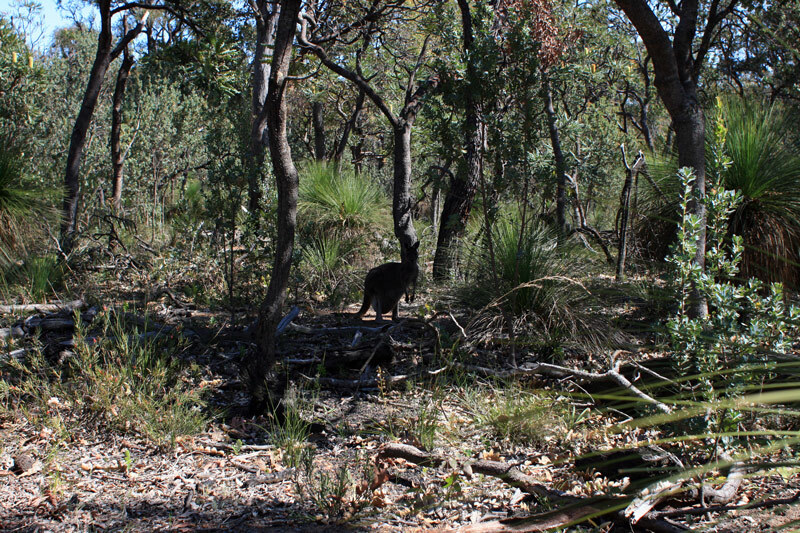 That’s the beauty of these forest trails it’s not uncommon to come across the local wildlife. It’s also pretty important to respect them as well – some may bite! At the finish of Lost and Found, we briefly join the Munda Biddi and continue cycling up the hill and right into Rocky Balboa. As the name suggests this is a trail of rocks, small ones in odd places, a corner section of all rocks and tree roots. There is little time to appreciate the surroundings on this uphill climb. This trail will teach you to make a decision and stick with it – the task of picking your line. If you’re new to mountain biking this is a trail you’ll remember because it will be one you will want to conquer in future runs. The good news is this trail is quite short at under a kilometre. My earliest fails when I started doing Rocky Balboa was forgetting to keep the arms strong and as I went to climb over the rocks I wasn’t putting enough pedal power after the first wheel passed over, leaving me stranded on the rock and falling backwards almost. Some sections I hop off the bike and walk over. One week I’ll conquer most of this trail, the next I won’t. Rocky Balboa meets up with Drago and to the right Apollo leads to the super fun downhill run – Mercury Street. 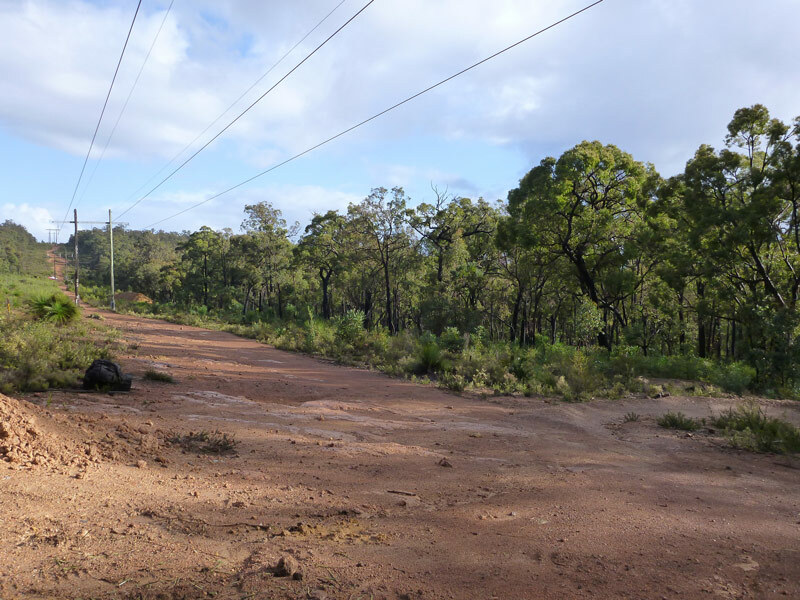 We are travelling to Mt Gunjin and exit the forest crossing the expansive powerlines track. We stop for 5 minutes to collectively gather our breath and slow the heartbeat that Rocky Balboa has brutally erupted. The view here is nice and if you’re lucky there will be a nice breeze too. We continue the ascent into Mother in Law where we will eventually reach Mt Gunjin. Out of all the uphill climbs in this area I always enjoy Mother in Law the most, perhaps it’s because the legs have warmed up at this point. Mother in Law doesn’t have too many rocks compared to Rocky Balboa and I enjoy the winding sections during the final climb to Mt Gunjin. Sure the last section of Mother in Law can be grimacing but it’s a satisfying feeling to reach the open space at the top. We’ve been climbing for the past 2.3 kms to a height of 398 metres. A few other riders have gathered around. A 4WD road allows for cars to shuttle riders to this section and this spot is popular for the downhill riders. We’ve ridden the road to the bottom at night once before and it was pretty rough on the mountain bikes that we won’t be doing that again anytime soon, best to stick with the mountain bike trails. I bought along some juicy mandarins and chocolate for snacks. We go with the chocolate, happily devouring it while watching the comings and goings of the other riders. On Mt Gunjin there are four sign posted downhill trails, Goldilocks, Judderbars, Lazarus and the most difficult Loco En El Coco. We split, I take Judderbars and Derek takes the black diamond Loco en el Coco. There are some fun rolls at the beginning of Judderbars before the tight turns wake you up in time for some quick descending corners. This trail is my first choice off Mt Gunjin and its ear to ear smiles the whole way down. Occasionally in moments of sheer excitement I’ll let out the occasional ‘yeow’ or ‘oh crap’ when my eyes a divert from the path ahead and I make a mistake. Judderbars is a rapid and rough descent if you aren’t hopping over some of the rocks, it’s a good trail to improve those skills. A couple of berms ends the trail at the powerlines track lower down the hill. Both trails meet up at the powerlines track and veer off again separately down the hill. I’m a weekend mtber and at this stage I’m rolling over jumps and the bike does an excellent job at absorbing my not so smooth descent. There is this one small drop off that I always chicken out on, only once have I cleared the drop purely due to forgetting it was there! The challenge definitely keeps me returning to the trails. I dream of clearing jumps effortlessly and if mental imagery worked for Michael Jordan it may just work for me, if I practice right? Eventually the two trails that we are both travelling on merge into Alchemy which given it’s location down the hill it carries some speed with it. The trail begins to plateau out and slow down but with a extra pedal power the momentum keeps going. At the very end is a jump, it is just as good to roll over and you may have an audience of other riders waiting for their buddies. Derek clears it and gets an approving nod from the guys. The descent was super fun, leaving us excitably pumped, so it’s an easy decision to climb the hill and do it all again. We begin another round of an uphill climb to the top of Mt Gunjin, however this time taking the nearest trail, Brand New Second Hand. It’s a mellow winding ride compared to the trails travelled along today. 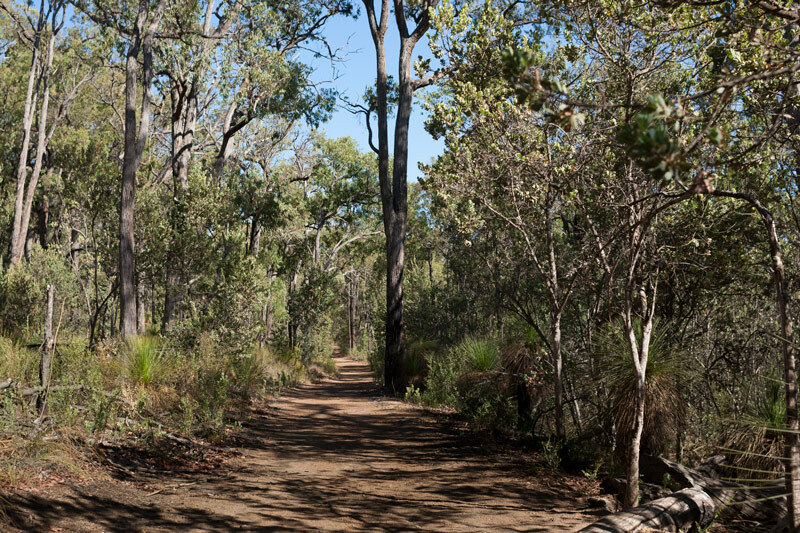 This quiet trail meanders through regrowth forest and a small section of eucalyptus trees. We seem to be the only riders on this shaded section. We cross Mt Gunjin road and into the forest onto Drago. This uphill climbing trail isn’t as difficult as the nearby Rocky Balboa, however to compensate for that it is a little longer as it snakes continually up the hill. It’s sweaty work getting to the top of the hill again. We repeat Mother in Law and reach Mt Gunjin once more. This time we pull out the mandarins for a snack and they are still chilled. I’ll miss mandarin season, it’s just not the same buying them out of season. With the car parked back at the Camel farm we decide to take the descending trails in that general direction. Beginning with a fast flowing descent into Goldilocks. I feel my arms begin to tire and my grip on the handle bars isn’t as strong. The descent uses just as much energy and concentration as the uphill activity and I’m starting to feel beat. At the fork in the trail we take Muffin Tops (left). Derek disappears in front of me taking full advantage of the fast flowy ride that this trail offers. Another fast trail to keep me in check and this one has plenty of exposed roots to go over. Again a good trail to learn to ride or even better, bunny hop over roots. The start of Horny Devil is marked when we roll through two trees in the shape of devil horns and I stop to take a couple of photos. I spot a butcher bird in the trees, this fascinating bird impales its prey near its nest. This long trail is narrow in some sections and is a great ending descent for the morning. This is a good trail to try if you haven’t been on a blue trail yet in the area. It also feels like this side of Mt Gunjin we enjoy more of a lengthy descent compared to the uphill effort required, so we are very happy. 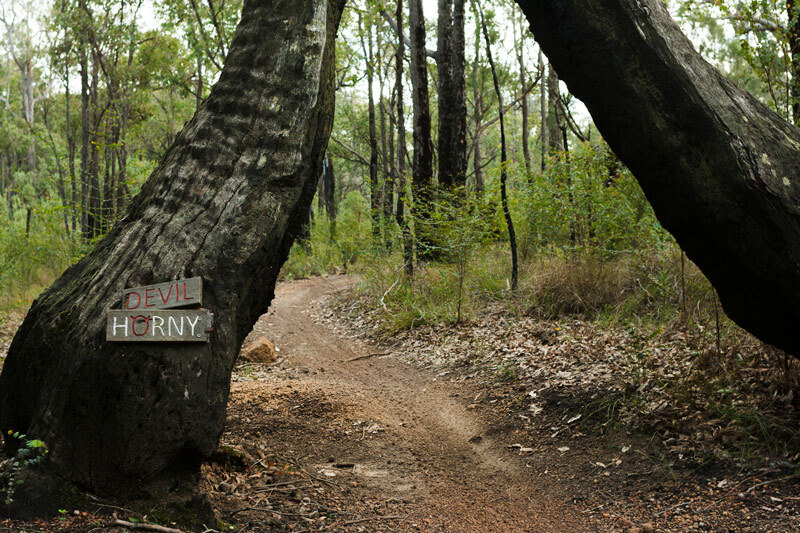 We cross the Munda Biddi touring route 3 times on Horny Devil. The last section winds beautifully through a section of trees almost giving the feeling of full flight. We return to the camel farm and its a bustling hub of riders and hikers. If we weren’t already wired up from the ride, the hot long black coffee from the nearby cafe gives us another rush! Awesome! It’s quite hard to stay away from these trails. 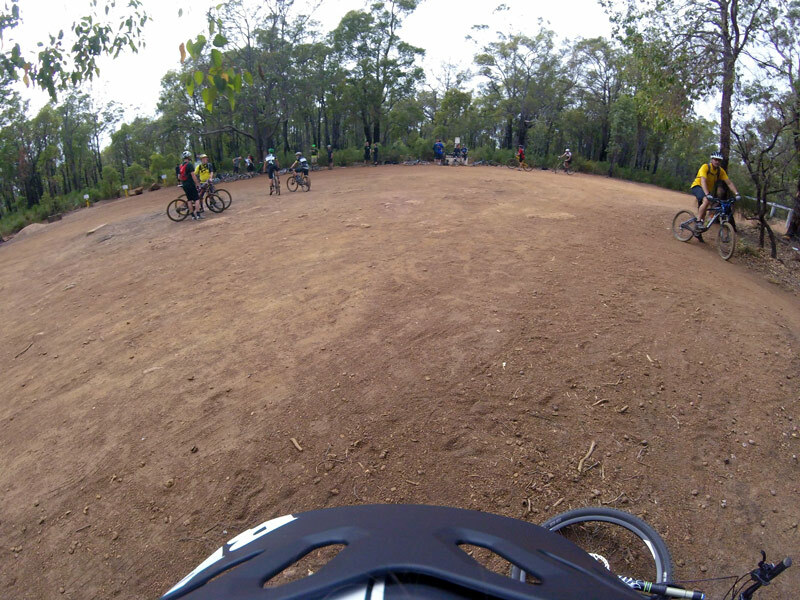 The best thing about the Kalamunda mountain bike circuit aside from the community spirit and the actual trails is the variety and ability to develop and progress at your own pace. 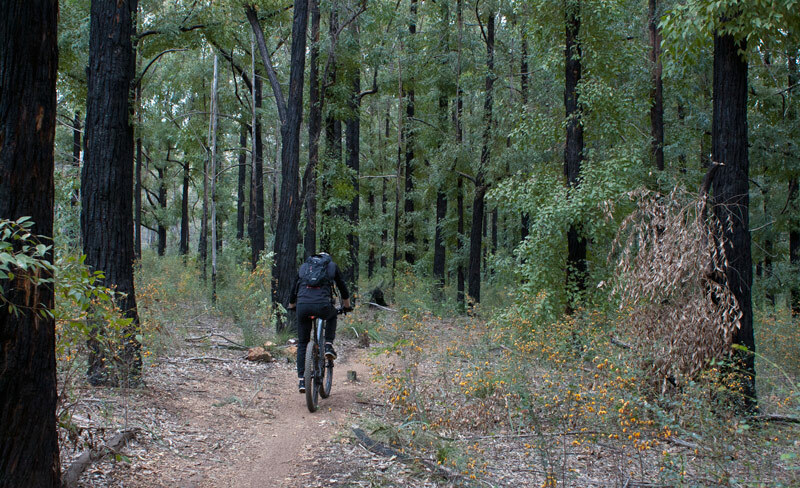 We like that we can mix up the rides with cross country and camping if we want to venture further along the connecting Munda Biddi trail. We also love the blue and black downhill trails run alongside each other which is great for mixed level riding groups. 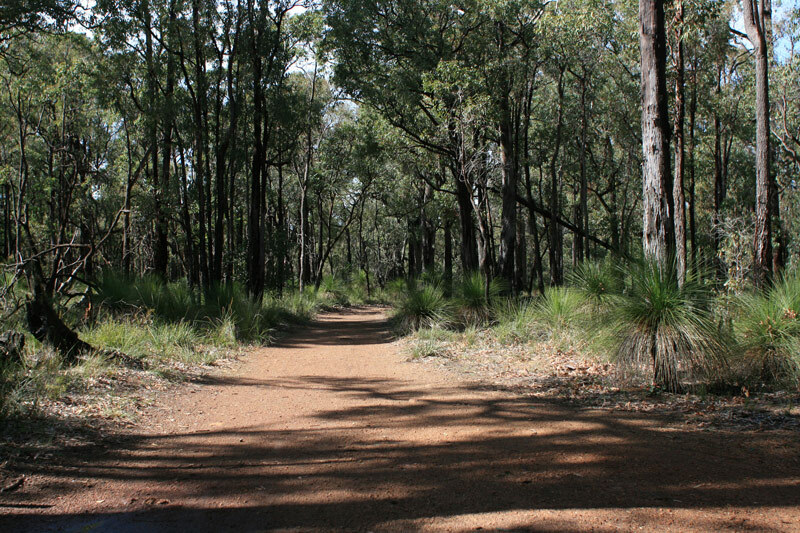 At only 40 minutes from Perth’s CBD, the trails are set in the forest and it is an incredibly relaxing experience to remove one’s self from ‘urban life’ for a couple of hours. If you are new to mountain biking these trails are especially good. Also during the year there are a number of friendly fun competitions to hone in on your newly acquired skills.